One of the most popular sprout varieties to grow at home, alfalfa sprouts have a mild flavor and mild crunch. Low in calories and loaded with vitamins and minerals, they're an excellent addition to salads and sandwiches, and they're also good for snacking. Alfalfa sprouts are easy to grow indoors year round. They can be grown in a seed sprouter or other container—and are ready to harvest in just 4-5 days. 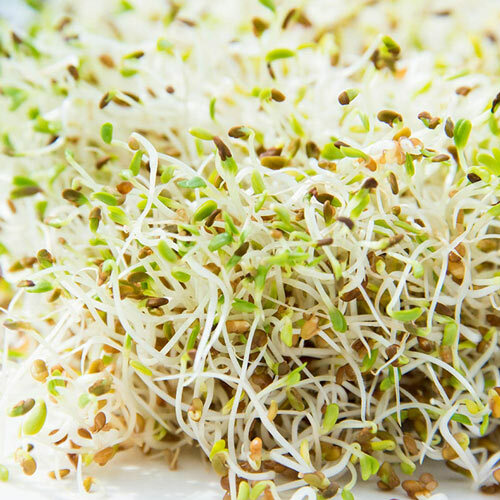 Alfalfa sprouts are ready to eat and most tender when they reach a few centimeters long. 4 oz. CommentsAlfalfa sprouts have a mild flavor, mild crunch, big time nutrition, and are easy to grow. It is an excellent tonic for the whole body, and it may help build iron levels in blood. Sprouts supply the highest amount of vitamins, minerals, enzymes, etc. of any food per unit of calorie.